Sprouts—Ages 3 to 5 (2 years): High energy classes using dance games and natural movement concepts to grow physical skills, increase stamina, open the creative mind and improve the student’s personal expression and musicality. This class uses fantasy and imagery to prepare students for a successful lifetime of dancing. Starts—Ages 6 to 8 (2 years): Weather moving up from sprouts class or starting ballet for the first time dancers in these classes will discover new skills as Starts. 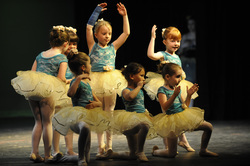 BALLET: The age difference in each class from Seedling to Flowers may vary, with an age gap from four to five years. All placement decisions are at the sole discretion of the artistic staff. Seedlings—Ages 8 to 10: For students who are ready to take on the challenges of classical ballet. We will begin classes at the barre and progress through a skill-appropriate technique class. We will address proper placement and alignment as well as coordination and body positions. Students will begin to understand how thoughtfully practicing ballet can allow their bodies the greatest range of movement. Rosettes—Ages 10 to 13: In this class the student is expected to have a basic understanding of ballet placement and simple combinations. We will begin to develop the more challenging coordination required to build pirouettes and big jumps. Flowers—Ages 13 & up: In this class students will be encouraged to take on more challenging steps and roles as they deepen their knowledge of ballet, the language of ballet, ballet history, and how ballet can be carried out in a healthful way, with concepts of Pilates and Yoga integrated in their technique. They will be encouraged to reach their own personal potential in a way that honors their own journey and deepens their love of the the art. Highland - Scottish Highland dances, including the popular Sword dance and Highland Fling, are typically performed to the sound of the great Highland bagpipes. This high energy and high impact dance form has a foundation in ballet and appeals to perfectionists. The prerequisite for the Int/Adv class is solid knowledge of the Fling, Sword, Seann Triubhas and Lilt. All levels will include a solid grounding in technique with a focus on the traditional dances but will also develop more contemporary material throughout the year. Ghillies (dance shoes) and white knee socks are required for this class. Scottish (Cape Breton) Step - A percussive dance form with both Scottish and Irish influence, this class will have a heavier focus on the elements of Scottish step. Strathspeys, reels and jigs will be danced to inspiring Cape Breton dance tunes whilst wearing tap shoes. A fun class for all ages and abilities and no previous dance experience necessary. Irish I - Entry level Irish soft shoe class where the foundation is laid for dancing ceili (group) dances and solo reels, jigs and slip jigs. Gillies (Irish dance shoes) and bubble socks are required for this class. Bubble socks can be purchased in class and we are often able to do a gillie swap at the beginning of the year for new dancers. Irish II-V - These class will include both Irish soft shoe and hard shoe and grouped by age and ability. As dancers progress through the levels, the steps become more complicated with quicker footwork and challenging movements. Please follow instructor recommendations for appropriate placement. Hard Shoe - A percussive dance form in the Irish tradition. Hard shoe jigs, reels and hornpipes will be introduced in the entry level class. It is recommended but not required that dancers have at least a year of Irish soft shoe before enrolling in this class. Special Irish hard shoes are necessary so please speak with the instructor before class begins. 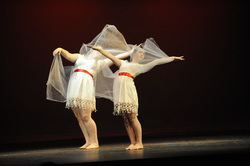 Celtic Company - This performance troupe includes dancers experienced in Irish, Highland and/or Cape Breton Step dance who have consistently displayed a high level of commitment to Celtic dance. The group travels across the region and throughout New England performing and competing year round which requires a regular rehearsal schedule. Celtic Company participation requires additional financial commitments for costumes, competition, registration and travel fees. By invitation only, if this is something that interests your dancer, please speak with Heather so she can talk to you about the group and give you advice on the steps needed to join the group and what to expect for family/dancer commitment. Hip Hop: Students learn the latest moves to the coolest grooves in hip hop, pop, rap and R & B. All classes are taught with age-appropriate music and choreography. Lyrical Hip Hop: More fluid and stylized hip hop is emphasized; pieces are set to slower or more emotional tracks of contemporary hip hop music. 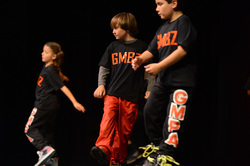 Freestyle Hip Hop: Students learn to find their own style when dancing. The instructor helps students learn how to create their own unique choreography in battle dance situations or in their own pieces. The technique taught in this class is offered to help students find interesting ways to express themselves when dancing outside of a choreographed piece. Breaking: Learn technique, strengthening, and the finesse of breaking in a supportive class. Students learn uprock, toprock, floorwork, freezes and beginning aerial moves. Learn the beauty, skill and grace that goes into the Smooth Ballroom Dances: Foxtrot, Tango, Waltz & Quickstep- while also learning all the fun and flair that makes up the Latin Dances: Salsa, Cha Cha, Samba, Rhumba, Paso Doble, Merengue and even East Coast Swing! Looking to hone your Performance Skills and Qualities while dabbling in a cross section of dance genres? This is the class for you. The chief focus will be on using the dancer's entire self to communicate, perform and to tell stories through movement and dance. We'll mainly explore Athletic Broadway Jazz, Lyrical & Contemporary Pop Style Musical Theatre Dances. Fosse: Learn basic american jazz technique and build strength while exploring the iconic choreography of Bob Fosse. We will learn excerpts of various Fosse works and then use the knowledge we have gained to create our own piece in the fosse style. Wake up your feet with rhythm tap dance! We will use warm-ups, drills, improvisational scores, and choreography developed by legends of the form as well as current icons to develop our sense of rhythm and timing and to hone our footwork. In this class we will explore various modern dance techniques throughout the year; every 3 to 4 weeks we will investigate a piece of modern dance history by learning about a new choreographer, their technique, and their impact on the evolution of the form. As a dance style in itself, lyrical is defined in part by a fusion of ballet and jazz, demanding technical skill, musicality and an expression of emotion. A solid, ballet-based technique, proper placement and bodily alignment are essential components. This physically demanding class relies on a base of Ballet and/ or Jazz as well as some acro and gymnastics skills. Mix that up with a fine tuned ability to connect to the material and to communicate a wide and diverse range of emotion in the work, and you've got Contemporary Lyrical! Expect lifts, falls, athletic adagio partnering, weight sharing, jumps, leaps and tableau work. Students will learn to sing tunes from multiple genres by many different songwriters. Ranging from Classic and Contemporary Rock, Pop, Theatre Tunes and Jazz. Instrumentalists are also highly encouraged to join GLEE! Staging, Choreography and a variety of performance and presentation skills will also be key pieces to this class. Adults of all ages are welcome and encouraged to let their inner American Idol out- and come together as a group to drill harmonies, phrasing, breath control and staging and choreography. We'll cover a broad range of material ranging from Rock to Gospel, Classical to Pop. Guitar, Bass, Drums, Ukelele, Pianists and Horn Players are also encouraged to join in on the GLEE fun!